Yesterday I had the honor to deliver a presentation (as a guest lecturer) to a Literature class at American University (my second time around for this class). When I got to AU I was fine, then I started sneezing like crazy, obviously allergic to the myriads of flowers blossoming all over the place (or perhaps the trees). Handkerchief in hand I started talking and somehow the drippy nose and sneezes went away and at the end I got a round of applause. Heiner Contemporary is launching in DC on May 20th with an exhibition of new work by Brooklyn artist Elizabeth Huey. The opening reception will be from 6-8pm that evening. Heiner Contemporary is located at 1675 Wisconsin Avenue NW, Washington, DC 20007 in Georgetown and we all welcome them to the DMV art scene and look forward to many great shows. Here is where you can read the process where last year I began the concept of marrying video technology with traditional drawing. And here is where you can read some of the initial reactions to the first piece during some of the art fairs in Miami. So that was my first video drawing... a good success, if I may say so myself. I then asked several museum collectors and two of the top video collectors in the world: "Have you seen or know of anyone who is marrying drawing with video?" The answer came back no. I'm not sure of this, but as far as I am concerned, if a few top notch museum curators have never heard of someone integrating video with drawing, and (more to my taste) two of the folks who regularly make it to art magazine lists of one sort or another concur, that makes me feel confident that I could be breaking new ground here and making Lennon and McCartney look bad. So (in honor of Charlie Sheen... not really) here's Part Deux. In a few weeks I will be in NYC at the AAFNYC art fair. The same folks who bring you Pulse. Over the years, I've had a spectacular sales record at this fair, and I wanted to show both Sanctus Guevarus and the new video piece there. In my head, I've been playing with deciphering a series of these marriages of highly accomplished (what was it that Kriston Capps described me as... draughtsman? The first time that I read this Capps Police description of my work I thought of beer, which is a good thing) drawings together with videos related to the drawings' subjects. The first series that came to my head was a series of video drawings on Latin American icons - each drawing showing them as an icon, with a little flavor of ancient Rome in the presentation of the iconic image with a few drops of human venom dropped in for good - in the video part. With the serial murderer known as Che Guevara it was easy. 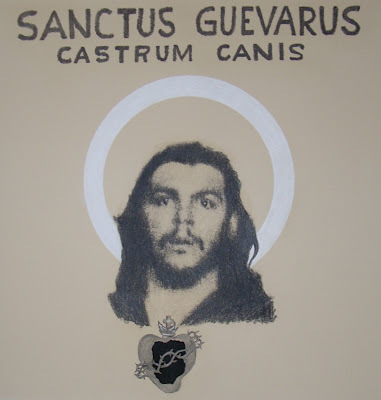 That "historic first ever video drawing showed Che as a saint while the video exposed a documented firing squad ordered by that Argentinean psychopath. 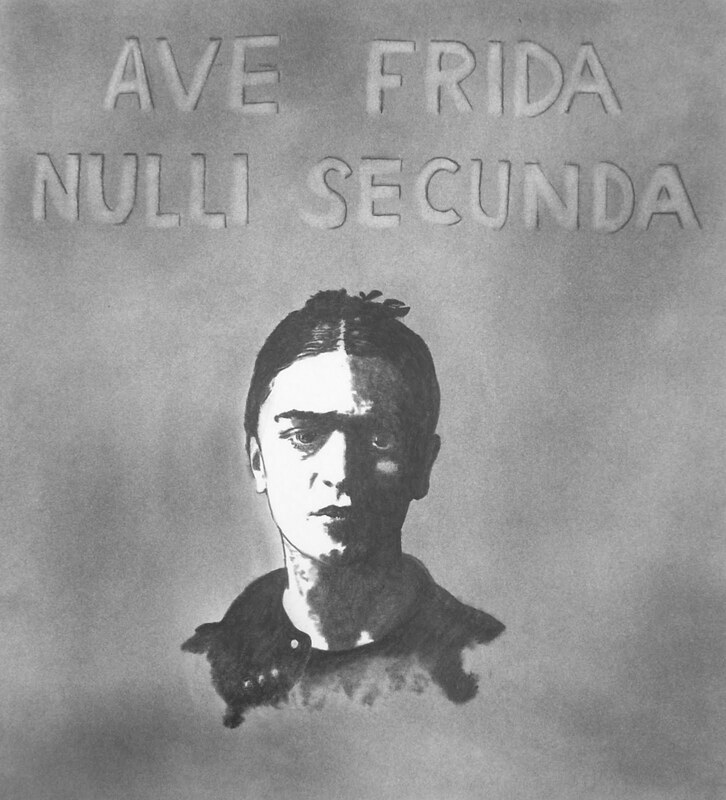 Che and Frida are the two most iconic faces of the 20th century, and both seem to have very few degrees of separation from me; and both interest me tremendously. Thus Frida Kahlo de Rivera is the second video drawing. It all started with the drawing (note to self: next time start with the video). Then I inscribed it with a Latin inscription, as icons tend to have, which proclaims: "Ave Frida, Nulli Secunda." "Hail Frida, Second to None." That was finished about six weeks ago. Then I struggled with the technical aspects of the video part. I wanted to have a good-sized screen play a video relating to Kahlo. One lesson learned from the first drawing was the size of the screen, so I shopped around for larger (and more affordable) screens which could play videos. Then I bought several of them, tried them all out, wasted precious hours trying to decipher their badly translated manuals so that I could learn how to actually play a video on their machines, and eventually settled on a model. Most of the wasted hours also related to the software that I was using to convert the native video format of my camera to the MPEG-1, 2 and 4 that the digital player said it could play. In the end, it was all the fault of the conversion software, which was a commercial software. I discarded it, tried a free version that I found online, and not only was it super-easy to use, but it also worked great. The drawing was finished, the custom made, hand-carved frame was done, and I had a video machine screen ready to go. Now all I needed was the video. Add tons of hours researching Frida Kahlo videos. 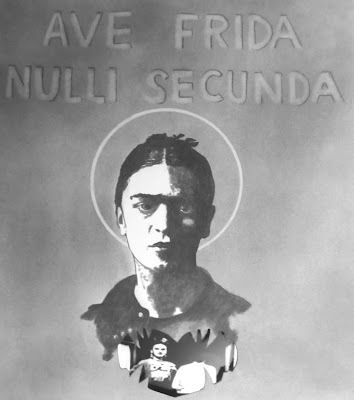 Did I mention that I wanted to show a Kahlo "home movie" as the video? Did I mention that I wanted an eye-catching Kahlo video? Did I mention that I wanted a controversial movie playing in my drawing? So then hours looking for reference materials, which soon led me to three sources. I then purchased copies of all three biographical documentaries on Kahlo, and the one done for Mexican television was the one that yielded copies of rare footage of Frida. I shot the video, did a little basic editing and tried it out. I then realized that I would have to install the video screen upside down, otherwise the remote control wouldn't work as there was no space left on the drawing to cut out a little hole for the infrared sensor. So I had to re-shoot all the videos, this time upside down, and re-edit them all. There is a word for this in Spanish: "escalofriante" (chilling). I then cut out Frida's heart out of the drawing. This will be the window into her soul and the window into the scant "moving pictures" references of her life. It is a feral heart, armed with sharp fangs that bite huge chunks of life out of life. And here is the drawing with the video screen playing the video. This will be fitted behind the drawing. And here it is with the video aligned behind the feral heart window and playing in her heart. Now to assemble it and frame it. The Post has selected a replacement for their art critic vacancy from "in-house" - did I call it or what? Update: Stop emailing me asking who it is! The WaPo will announce it soon (there's already an internal memo) - my guess is that the chosen one is that guy who does all the "cultural" writing and architectural criticism... I can't think of his name now... ah... Philip Kennicott. My second guess, if "in-house" also means their new freelancers since Jessica Dawson left, is Kriston Capps. You've just gotta read this.